(Natural News) U.S. federal agents seized at least a million pounds of pork that was being smuggled from China into the country in more than 50 shipping containers via the ports of New York and New Jersey – meat that could be contaminated with a hemmorhagic virus that wipes out entire pig populations in Asia. African swine fever virus has ravaged the world’s largest hog industry in China and sent pork prices skyrocketing. Now the Chinese are considering greatly decreasing their imports of U.S. genetically modified soy that’s used as pig feed. The deadly pig virus spreads quite easily and is very resilient. And yes, the meat products and even the animal’s feed can carry the virus. When will an outbreak in the U.S. occur? It’s just a matter of time. The deadly pig virus has already spread to Russia and Eastern Europe. It seems just a matter of time before U.S. pigs catch it, spread it, out get wiped out in genocidal form, like in Asia now. U.S. border protections are loose and need a good ratcheting to prevent this catastrophe. All high-risk pork products should be banned by bio-security experts immediately. We need quarantine stations and increased cargo inspections, especially for imports coming from Russia and China. If the virus hits U.S. pigs, it could cost our economy tens of billions of dollars a year in losses. So far, scientists claim the pig virus is not transmittable to humans, but the virus could mutate into a form that is, and that dredges up another related horrific concern. Natural News has covered, repeatedly, how one insidious U.S. vaccine manufacturer (and pediatrician ironically) designed a childhood vaccine for Rotavirus using two strains of another deadly Asian pig virus called Circovirus. With no rhyme or reason, freak doctor Paul Offit mixed the deadly pig virus into his highly controversial “Rotateq” vaccine. The adverse events and side effects listed on that vaccine insert include intussusception – where the injected child’s intestines become entangled and the infant can die. Will the CDC and freak doctor Paul Offit design a new “mandatory” and “safe and effective” childhood vaccine that contains the African swine fever virus? Offit made millions off Rotateq, thanks to the CDC, while children across America are maimed and dying of “unknown” causes. Inspections aren’t enough, though. The U.S. needs radical changes made to not only the meat import industry, but the soy import industry, since the virus can transmit through animal feed. Plus, because most meat in America, including cow, chicken, turkey, and swine, is raised in corrupt, contaminated confined animal feeding operations (CAFOs), parasites, pathogens, and viruses are already of epic concern. If the American “Big Food” industry, including meat and dairy, continue with business as usual, it’s almost unavoidable that some genocidal virus will break out everywhere. The African swine fever virus is easily spread through contact or contaminated meat products and can survive in processed meat, like hot dogs, deli meat, and sausages, for months on end. There is currently no cure for African swine fever virus, and once it’s discovered to have infected a herd, the farmers must wipe out every pig in the vicinity. 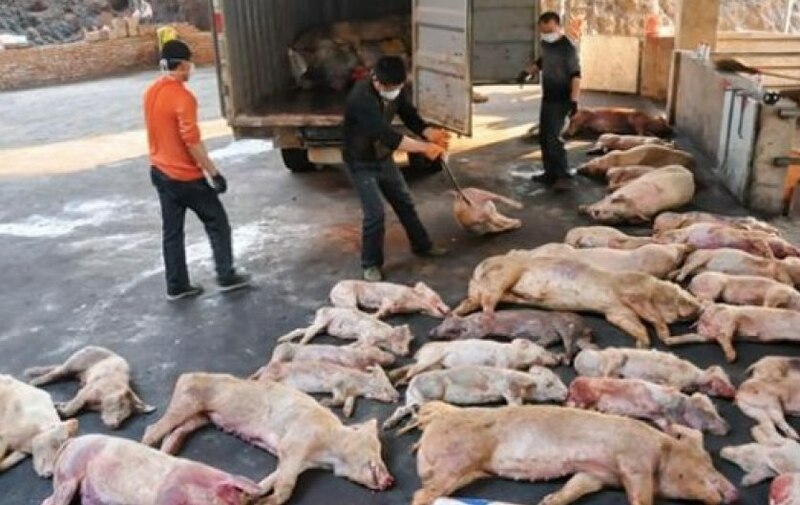 In China, where half the world’s pigs live, well over half a million have been executed from threat of the virus spreading. The U.S. imports massive amounts of food from China, so the virus threat is of high concern. The virus can live outside the host in all kinds of conditions, even in dirt. Tune into Vaccines.news for more updates on imported deadly pig viruses that are used in U.S. vaccines to maim children.